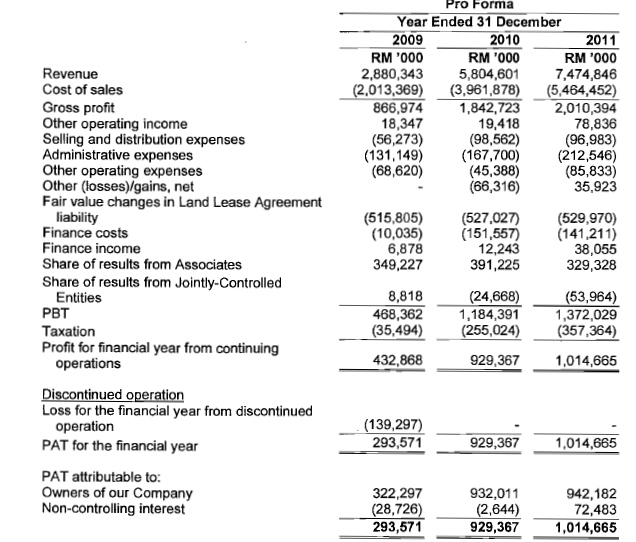 SERIOUS Investing: Deciphering FELDA's IPO - really that attractive? FELDA Global Ventures' (FGVH) IPO (2nd largest in the world this year) is a listing which is creating buzz over the Malaysian media more so for its political reasons rather than valuations. If you read the main media, the ruling government is claiming that the IPO is an exercise which will protect the future of more than 112,000 FELDA households. Whereas the opposition is claiming that it is an exercise purely for the coming election where the government is trying to conjure votes through immediate imbursement (RM15k per family) to the settlers of whatever partially thats raised from IPO. However let's look at how attractive the IPO is especially when the government is pushing through the offering during a period where many companies in the region are postponing theirs. Hence from the list although the total offering is up to RM10 billion, in actual fact the public portion (eventual float) is pretty small. This strategy is probably to protect itself from large scale sale upon listing as what was experienced by Facebook in its recent IPO. From the list, parties that may be interested to sell in the short term are the retail and MITI investors (total 18%) while the other investors (which they called cornerstone investors) may be advised not to sell. Some of the potential investors such as Louis Dreyfus and state agencies are strategic investors anyway. From that list, it is not difficult for any party to support the share price assuming the price per share is RM4.55. Upon IPO, the market capitalisation is RM16.6 billion assuming its price is RM4.55. What about its Proforma Income Statement. From the 2011 numbers, historical PE will be around 17.6x - Not cheap for an IPO, hence I am wondering whether it will get a premium of at least RM1 as what many people are speculating. In fact, 2012's first quarter results dropped against its 1st QTR 2011. What about its NA after listing as this is a agricultural company which owns land and cash from the IPO. Not that attractive either - 67% of its listing price. Achieving a RM1 premium would have caused the company to have a market capitalisation of RM20.2 billion and historical PE to exceed 20x. Considering FGVH's structure where the settlers are working on the land in smaller scale and with follow on sale of the Fresh Fruit Bunches to FGVH for further processing, it will never be able to achieve the scale of much larger commercial entities like IOI Corp, KL Kepong and Sime Darby. As a result of that, one tends to provide a good discount to a less efficient entity. Against its competitors, FGVH's valuation is as below. Let's assume that upon listing, FGVH will be able to reduce its debt and increase its production, hence providing better profits to its shareholders - how much better could it conjure up? Considering the controversies surrounding the structure and its political struggle, FGVH's IPO cannot afford any failure especially to the government. As a result of that, I am suspecting its share price to be supported in the short to medium term, but in the longer run (say after 1 to 2 years) - who knows how it will turn out to be? As a longer term investor, I probably am better off buying Sime or IOI. I am also reading from analysis (probably they got it from FELDA's analysts' briefings) that with the IPO fund raised, FGVH will be aggressively acquiring assets in Africa and Indonesia. Question - is it really that easy? My question is how do we value "aggressiveness". Do we put a higher premium if FGVH says that they are going to be aggressively expand its business downstream? If this is case then we should not put a high valuation for companies that pays high dividend as by paying dividend, they are not being aggressive. Are we contradicting statements? Latest: Louis Dreyfus has pulled out from participating in the IPO. Will EPF buys into FELDA now that its CIO is a director?